Our new truckles are inspired by the award-winning cheeses currently under the Lenberg Farms brand: Lindsay Bandaged Cheddar, Tania and Zoey. The truckles are younger versions of their counterparts, each with their own distinctive flavour. Inspired by Dutch names, Luuk, Taavi, and Zander are hand-dipped in black wax and embellished with brightly coloured labels. Beautifully merchandised, these products are sure to stand out, not only in appearance but also with their unique taste! Taavi, inspired by Tania, is a 4 month old, 100% sheeps milk cheese. 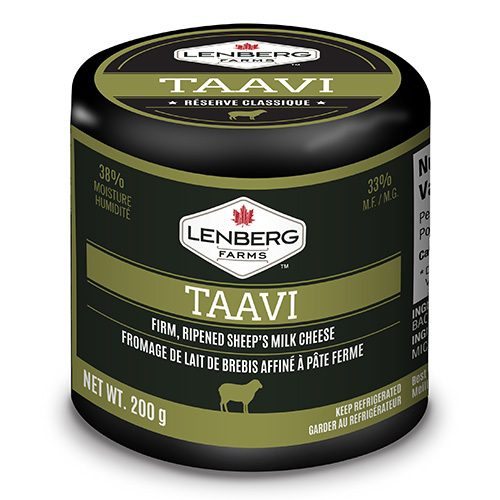 Taavi provides a sharp tang with a pleasant aroma.